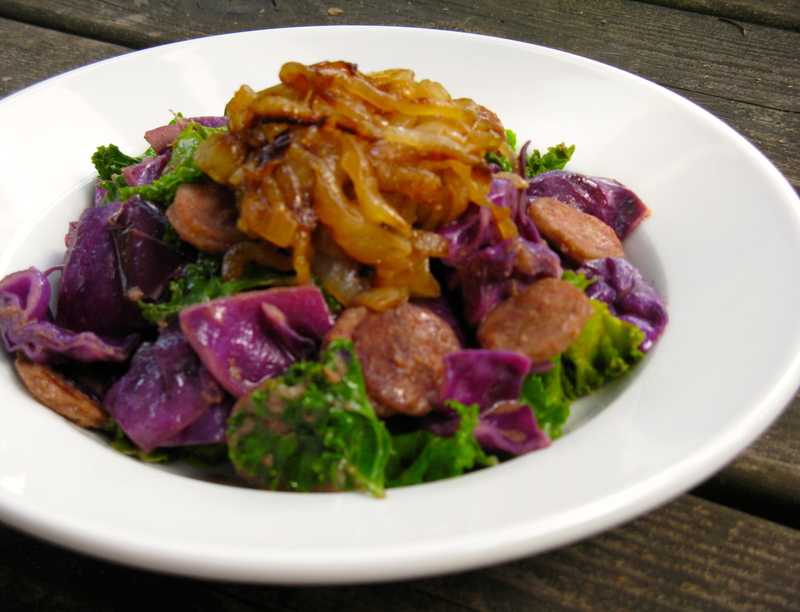 This bratwurst saute with caramelized onions is very German inspired and true to my heritage. It’s one of the stinkiest meals I’ve ever cooked, but dang it’s good and worth the stench in the kitchen (or in our case, the whole house since it’s very tiny). Honestly, the smell really isn’t too bad — I just like to exaggerate sometimes. Meanwhile, it has been such a great week and there’s a lot of exciting things happening! I know I often express my gratitude on here and I’m doing it again: I am SO grateful for the life I’m living and what I’m creating for myself. I owe a lot of my happiness to eating optimally, which has made me a more sound thinker, more decisive, motivated, optimistic, positive, creative and sane. I am not the incredibly indecisive (only a little now and much, much less), worried, satisfaction seeking (and never reaching), argument-prone and unstable person that I used to be. My brain, gut, cells and body are now healed, happy and supported. On another exciting note, Jesse and I registered for a Mobility Wod movement and mobility seminar with physical therapist, Kelly Starrett himself! Not only are we stoked to learn from Kelly in person, but we get to do so in Honolulu! A mini vacation and an amazing learning opportunity! You see, Jesse mentioned the seminar to me last weekend and ever since, I’ve been diligently looking into travel options. Each day, the cards seemed to be more in our favor, so we committed to making it happen yesterday. If you don’t know who Kelly Starrett is, check out his book, Becoming a Supple Leopard or visit his Mobility Wod site, linked above. Add the butter or ghee to a large skillet over medium-high heat. Add the onions and allow to sizzle in the duck fat. Reduce heat to medium and continue to cook onions, stirring occasionally. After a few minutes, once softened a bit, add some of the vinegar. Continue to cook the onions, tossing occasionally. Once the onions begin to caramelize, add a little bit more vinegar if needed and toss again. Keep cooking until they are caramelized to your liking. This takes a bit of time, so be patient. Once done, remove the onions from the pan and set aside. 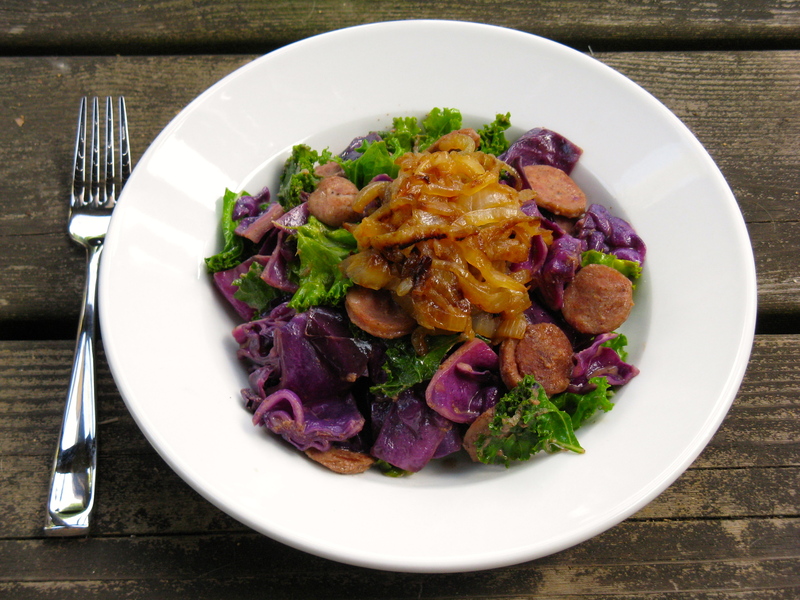 In the same pan you cooked the onions, place over medium heat and add the sliced bratwursts. If needed, add a little bit more duck fat for cooking. Saute the brats for a few minutes, allowing them to get a little brown. Then, add the chopped cabbage and pepper. Give everything a good stir and then add the mustard and chicken broth. Place lid on the skillet and reduce heat to medium-low. After a few minutes, remove the lid and stir in the torn kale leaves. Once the kale has wilted down a bit and the cabbage is softened, remove from heat. Serve with the caramelized onions on top. You are amazing and so inspiring. I love how you make it so abundantly clear that our choices in how we nourish our bodies directly reflect how we nourish and create our lives. Aw, thanks Ashley. That makes my heart smile! This looks amazing. I could probably eat a bowl of just the caramelized onions. That’s how perfect they look. Yeah, the onions are pretty darn amazing! We had a tiny bit leftover, so I ate them on top of my runny eggs the next morning…so delicious!